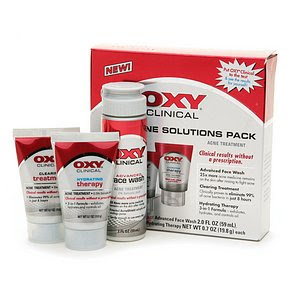 If frequent breakouts are your problem, and you need a drugstore option that's really going to work, OXY Clinical Acne Treatment, Acne Solutions Pack will be your new best friend. The kit contains a facial wash that leaves additional acne fighting treatment on the skin after it's washed off, yet, never felt sticky or gummy on my skin. I loved the fresh scent and it really cleansed my skin well without overdrying it or irritating my pimples more. Next I used the clearing treatment on the actual areas where I had the breakouts. In this case my cheeks. This does have stronger, skin drying and bacteria killing ingredients which didn't irritate my skin, but I noticed that it really dried the actual breakouts. Note: If you have very sensitive skin, you may want to patch test this part of the treatment on a small portion of your skin or just on one small pimple to see how your skin will react. The feeling of dryness was relieved quite a bit by the third and last step in the treatment, the hydrating therapy, which put moisture back into my skin and felt really nice. It's oil free, lightweight and smooth going on. It's also designed to continue exfoliating the skin, and has oil controlling ingredients in it. This was perfect to use as an overall moisturizer, since it also cut down on the shine in my t-zone during the day. I used the entire three steps both morning and night for one week, I was really pleased with how much my acne had reduced in size, the redness was eliminated and my skin felt soft and smooth. I continued on with the treatment for two more weeks, and all my breakouts went away. I now use it about 3x week just for maintenance, and have noticed that if I do still get an occasional flareup, it is much smaller than it used to be, and it goes away within about a day or two after using the entire three steps 2x day again. With a new school year right around the corner, this is a perfect way to return to school, (or have the teen/college student in your life if you're a parent), return with lovely, healthy looking skin! - H.L. *This product was provided courtesy of Oxy PR for reviewing purposes. Very helpful post. Thanks alot.